Yesterday's post got me thinking. I've read a number of autobiographical comics over the years. Everyone from Robert Crumb to Frank Page. And I've read a number of biographical comics over the years. Everyone from the Dalai Lama to Matthew Henson. And it occurs to me that the autobigraphical ones are, on the whole, far superior to the merely biographical ones. The most recent comic biography I read was of Leon Trotsky. The one by Rick Geary. You know, Rick Geary? Guy won an Inkpot Award and the NCA's Book and Magazine Illustration Award. Had his work show up National Lampoon, Mad, Rolling Stone, The Los Angeles Times... He's proved that he's talented many times over. But his Trotsky biography? Well, I was very disappointed. 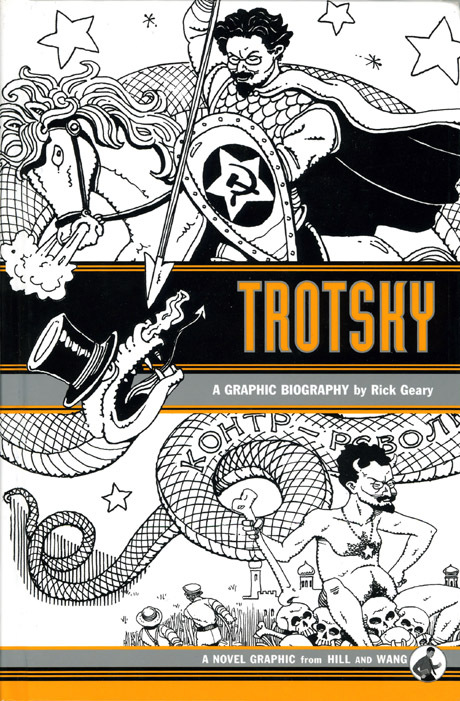 The illustrations were fine, and it did a fine job of overviewing Trotsky's whole life. But it was dry and pretty unengaging. Part of the reason for that was that the story was told almost exclusively through captions. There was very little dialogue at all -- it's been a few weeks now since I read it, but I want to say there were less than a dozen dialogue balloons in the 100-some pages. I had difficulty relating to any of the characters because they were presented in a very flat way; I could have just read an encyclopedia entry. There was no sense of personal connection or dynamism or any real emotion whatsoever. I found similar issues with Spain Rodriguez's biography of Che Guevara. Che Guevara, for Pete's sake! The dude led a frickin' armed revolution in Cuba and overthrew the government! There's no reason that should be a dull story! If I can't relate to the guy, there should be plenty of guns and explosions and death to at least make things superficially interesting. On the other hand, even autobiographies that I don't particularly care for generate an emotional reaction. I felt the second book of Marjane Satrapi's Persepolis was painfully ego-centric and self-indulgent, and got me to severely dislike the character I liked in the first book. But it still provided an emotional connection. I suspect that much of the issue is that autobiographies are an inherently personal project, so creators invest much of themselves in it. Even the stories that start to go far afield from creator's actual life have an emotional truth that resonates about them. Biographic comics, by contrast, often are told with a distinct emotional reserve with an emphasis on getting the facts right. I suspect that's what happened with the Trotsky and Guevara pieces -- the authors were so concerned about depicting the characters accurately, they refused to put words into their subjects' mouths unless there was a record of something actually being said. I suppose creators feel more able to tweak their own stories a bit for narrative purposes because, after all, it's their own story. Whereas tweaking someone else's story is less acceptable because the creators don't "own" it in the same way. I don't know that comics are necessarily the best medium to convey the facts of someone's life. If nothing else, it would be difficult at best to have a precise record of every significant or noteworthy moment for the comic creator to draw upon. But that's not to say that the truth of someone's life couldn't be readily conveyed through comics. I'll cite that book on the Dalai Lama as an example; there was almost certainly no record of the actual conversations that took place when he was initially found, but author Tetsu Saiwai relayed an engaging scene of it by getting to the emotions of that event, even if the specifics were lost to memory. I still plan to keep my eye out for both biographies and autobiographies in comic form. Even the poorly executed biographies teach me something. But I think it'd serve creators of comic biographies well to take a few liberties with their subjects for the sake of making an impressionable and engaging story.